In the past, Roger has shown us time and time again, that internal dust and other artifacts rarely have an effect on the image quality produced by your lenses. With how complicated the optics in a lens are designed, lenses are rarely affected by these small flaws such as lens dust. That said, every piece of equipment that is on the shelves at LensRentals.com is thoroughly cleaned and inspected multiple times before being shipped out. Cleaning and regular inspection of your gear and help prolong the life and help give you the highest quality of images possible. Today, I’d like to take you through how we often clean and inspect the glass that gets shipped back and forth from our office, and some of the problems that we face. Cleaning a lens can be done with 4 main tools – A Lens Cloth, A Rocket Blower, Wipes, and a Lens Pen/Brush. 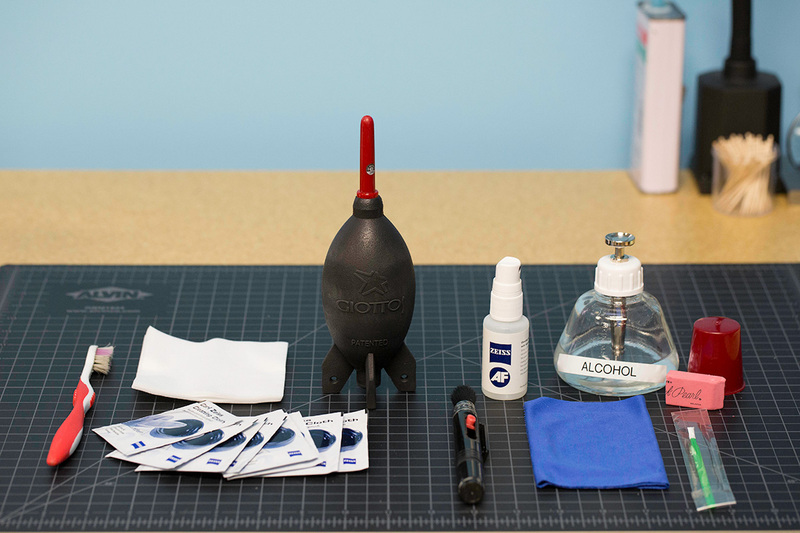 Using and or all of these tools will help keep your camera gear clean and looking new. Often, these products can be found for only a couple dollars at camera stores, and it’s a good idea to have them stuffed in your camera bag for an emergency, or not so emergency cleanings of your camera equipment. The best way to remove large debris from your lens is by using a rocket blower because you’re not required to make contact with the lens (which can often create it’s own smudges and runs the risk of scratching the front or back element). Once the large objects have been removed from the glass element, it’s encouraged to be cleaned with a wet cleaning solution, and a clean microfiber cloth. Simply lightly wet the element of the glass, and lightly clean the element with a clean microfiber cloth in a clockwise circular motion or Carl Zeiss pre-moistened wipe (followed by a clean dry microfiber cloth). Sometimes, though, wet cleaning solutions will leave a streak, and for that, we prefer to use a tool called a LensPen by simply going over the area one additional time. However, if the front or back element of your lens is not dirty enough to warrant a wet cleaning, you can use what we call here at LensRentals, the “Hah” method. The “Hah” method is simply but carefully using your hot breath to fog the glass, followed by a cleaning using a clean microfiber cloth. This technique is also recommended for filters, as they often have a special coating on them making them difficult to clean using wet cleaning solutions. Often, we’ll use a toothbrush to help clean the barrel of a lens. The teeth in the toothbrush help clean the small groves often places on zoom and focus rings. I (personally) recommend not using any wet solutions on the lens barrel, as liquids can get into the lens easily, and destroy the electronic focusing motors. Remember what Roger always says, there is no such thing as a true weatherproof lens, despite what the manufacturers say. It’s never recommended to clean the lens contacts unless you’re receiving some sort of error code, or need to perform a diagnosis on the lens. Often, the lens contacts are made of sensitive and soft metals, so cleaning them can sometimes do more harm than good. However, if you are receiving a connection error code, you can try to clean the contacts using a simple pencil eraser. Though be careful using this method, to ensure no eraser shavings enter the lens. The other option is to use an alcohol swab and clean cloth though I recommend again to only do this sparingly, and if you’re receiving some sort of error code. Dust will forever be a part of photography, and you’ll never be free of it. A little bit of dust is unlikely to affect image quality, but by preventing dust accumulation, you can avoid expensive costs of having to have your lenses professionally cleaned. Not only would a professional cleaning of the internal parts of your lens be time-consuming and expensive, you also risk harming your lens and inviting more problems in the future. Here are some simple tips to prevent dust in your lens. I’d elaborate on this, but our Lens Tech, Joey Miller recently wrote an article on testing your equipment and correcting any sharpness and focusing issues you may be experiencing. Over time, all lenses will become softer and more prone to incorrect focusing, so it’s important to test your gear regularly to check it’s focus and ensure it’s not back or front focusing. Like everything, your lenses will wear down over time. It’s important to make note of these problems to help prevent future problems. Much like a car, regular servicing of your gear can help prolong the life, so make sure to check your gear often to make sure everything is working properly. Here are some of the problems you can face when using a lens regularly. With frequent use, a lens mount can become looser over age. This will result in some slight wiggle in the lens when mounting it to the camera. While a small amount of wiggle is not usually a problem, the result can sometimes lead to bad connections, which will require servicing. Sometimes, lenses will jam up when zooming. While rare, this usually means there is a problem with the internal pieces within the lens. This will get worse and worse, so when you experience it, I recommend you send in your lens for servicing. If you start seeing loose screws on your lens, it’s recommended to send it in for servicing, as there is often internal screws coming loose as well. This happens over time, and screws are often checked and tightened with a standard lens service. Loose screws are often what lead to zoom jams. Loose front elements can become an issue over time from applying too much pressure when cleaning the glass, or with repetitive counterclockwise motions on the glass. Front elements provide a key importance when it comes to the protection of the internal components, so if your front element is loose, get the lens serviced from the manufacturer. Some image stabilization units are louder than others, and can become a problem with prolong use. Be sure to watch for any problems that can come with IS, such as abnormal jerky movements when focusing, no bouncing when panning, or loud motors. Springs can shake loose, and lead to expensive repairs. It’s recommended to turn IS off before you turn off your camera, as this will often lock the IS system into place and help secure it when transporting it. Lenses contain a lot of moving parts, and sand does a great job of stopping those moving parts. Always be careful when shooting on beaches or other places with sand, as sand can easily damage a lens. As mentioned above, and as Roger says time and time again, there is no such thing as a weatherproof lens. Even if Canon, Nikon or Sony claims their gear is weather-sealed, they won’t repair it for free if it has water damage. Water can easily kill the electronics in a lens (or camera body), so if you’re shooting in a wet environment, be sure to get yourself a plastic lens coat. 95% of the time, dust on or in a lens won’t have any effect on the image quality. If you are seeing dust, it’s almost always because it’s sitting on your sensor, and not on (or in) your lens. To test if your sensor has dust on it, simply go into a bright environment, and shoot at f/12-22. You’ll be able to see the dust as dark spots on your images, and you’ll want to clean your sensor (either carefully watch videos on the topic or pay to have it professionally cleaned). Most commonly, if you receive an error code from your camera, it’s because the camera is not properly communicating with the lens. The easiest way to fix this is to re-seat the lens or clean the contacts as explained above. Other errors can come in card errors (make sure you have the correct speed and type of card for your camera, and format it if needed), and battery errors (happens most often with off-brand, generic batteries). Hopefully by now, I haven’t completely scared you of all that can go wrong with your camera and lenses. Remember, with the right care and maintenance, lenses and optics can often outlive you. Taking care of your equipment is easy and necessary to ensure a long life of sharp, clean images. If you have any recommendations on how to clean your gear, or additional problems to look out for, be sure to add your insight in the comments below. However, breathing on lenses can result in a discharge of various organic compounds, including food particles that may enable the establishment of various bacteria and fungi on the glass. Yep! You can, very, very carefully, put some tape over your finer or a tool, sticky side out and pull up that lint. BUT DON”T TOUCH THE REAR ELEMENT. You can eventually, probably clean sticky off the back glass but it’s hard and you’d really rather not do it. I used both lens papers and microfibre cloths (the fine kind you’ll get with a nice eyeglass perscription etc..) They work well in both regards, but I trust lens papers a bit more. You do use a few of them per element, but when it’s clean, you know it’s really quite clean. To me, microfibres always make me feel like I’m just re-depositing dirt onto the lens and swishing it around. Nice article, but be very careful when recommending pencil erasers. Only the soft rubbery ones will do. Many others contain abrasive materials that will damage the gold, silver or chrome coating of the contacts. Great artucle! Your blog is always chock full of meaty technical details. Quite the opposite of the marketing jargon fluff on manufacturers sites. Hey guys, I’m not sure if you’re familiar, but the 100L has a recessed rear element with a kind of felt-like black interior. Mine has mostly sat in the cupboard but seems to have a build up of what looks like white lint. Any tips for cleaning? I’ll upload a photo when I get home. They already removed this nonsense from their page. why not? zeiss is using lens pens all day. i don´t get what the pictures with the brown triangle should show us…..
the influence of dirt on the rear element with different apertures? Great article! How do you guys clean the micro fiber cloths? We’ve had enough of those AW lenses and bodies fail to put too much trust in their seals. But Nikonos and the AW line are “waterproof” not “weatherproof”. Semantics, sure, but the article was referring to general lenses, not those specifically designed for underwater applications. Internet components need protection also. Very rarely, Roger. We ship hundreds of lenses a week and maybe once every couple of months someone complains. I hope that rental customers are somewhat more realistic than most, but despite meticulous care and cleaning, how often do customers complain about receiving a lens with dust inside? That goes against everything I’ve learned, where it’s always been stressed to wet the cloth or tissue, not the lens itself. Nikon will disagree with you as far as the Nikonos and 1 Nikkor AW lines go. While I agree that cleaning lenses is often unnecessary, when shooting video, a dirty lens can be quite vexing. I worked at a TV station for many years where we shared cameras. They were in constant use and often got quite dirty with the constant use in harsh environments. I found it almost impossible to get good shots looking into the sun with these lenses due to the dirt, dust, and scratches on the protective filters we used. If I really needed the shot, I had to remove the protective filter and blow the dust off the front element.